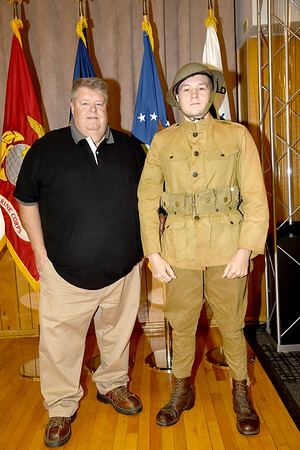 Submitted photo by U.S. Army photo by KEVIN JACKSON | Jeff Wolf, Armed Forces Day Committee member, and Joseph Wortham, a MCAAP employee, dressed up as a World War 1 Soldier, aka Doughboy. wearing his great grandfather's WW1 Army uniform. His great grandfather wa Hilliard Conrad Ernest Wolf.